Remember the good old days when dressing up as a mummy meant looking like an Andrex puppy! Or if you did have real bandages, they would quickly sag until they ended up bunched around your ankles. 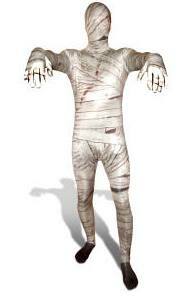 If you do want to be a mummy this Halloween, make life easy with this Mummy Morphsuit Fancy Dress Costume which comprises of a head to toe stretchy lycra body suit. Printed with a bandage design, there's no need to raid your cupboards or stand still for hours. And you'll look just as good at the end of the night too.